Now there is one phrase which you hear a lot this days in a few places. 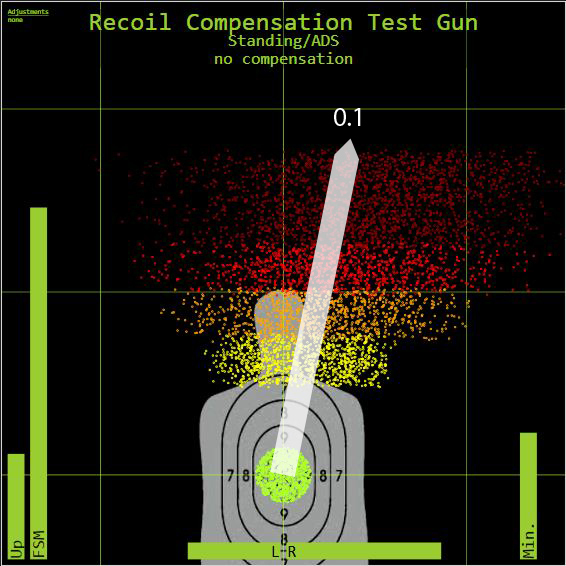 ItÂ´s "Recoil Compensation". So letÂ´s start a boring and very theoretical thread to explain it to everyone...yeeeeeeeeeey! Note: For all following plots i will use a fictional gun with 900 rpm, 0.25up/0.3left/0.5right and x2.5 FSM which is pretty much an average AR. I added a constant 0.15 spread to make the results better visible (no spread increase). Plots made with SymPlot by Aimdrol. Ok, so thatÂ´s how it would look like if you can compensate perfectly. But why can I compensate for vertical recoil but not for horizontal recoil? The average human reaction time is ca. 200 ms or 0.2 s. Our fictional gun has 900 rpm or one bullet every 66 ms. That means every 66 ms the gun will kick to the left or to the right somewhere in between 0.3 left and 0.5 right. RANDOMLY. Your chances on compensating this recoil with a reaction time of 200 ms are pretty much non-existent. There is no way you could predict the randomnes of the recoil. ItÂ´s a game-mechanic we have to deal with. No compensating here. But why can I compensate for drift then if itÂ´s created by horizontal recoil? And what about vertical recoil? Vertical recoil moves the gun straight upwards at a constant average speed (again 'average'). ItÂ´s pretty easy to learn how fast you need to 'aim down' in order to compensate for it. This should be pretty obvious. WhatÂ´s up with the average speed? Your gun kicks up every time it fires and does not move upwards at a set speed. 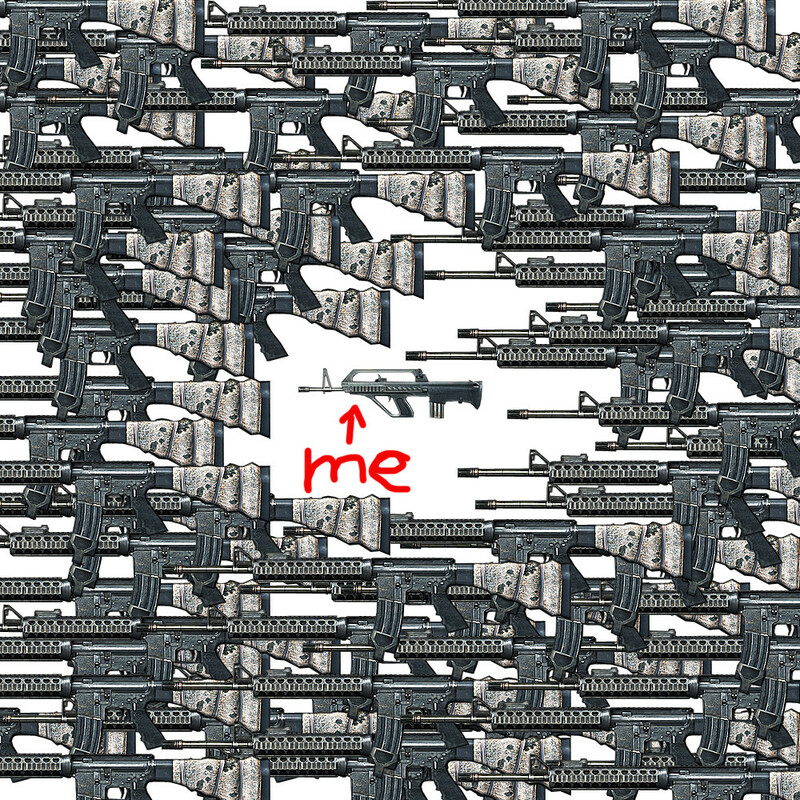 In our case with our fictional gun this happens 900 times per minute or every 66 ms. But you canÂ´t move compensate for 0.25 recoil every 66 ms, can you? 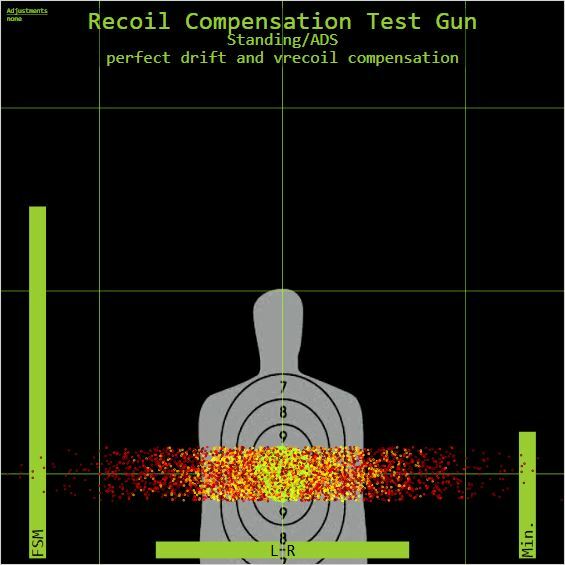 Instead you will compensate for the recoil at a certain speed, the average speed your gun recoils up (resulting from moving up 0.25 degrees every 66 ms = 225 degrees/minute). This way you will stay on target quite precisely. 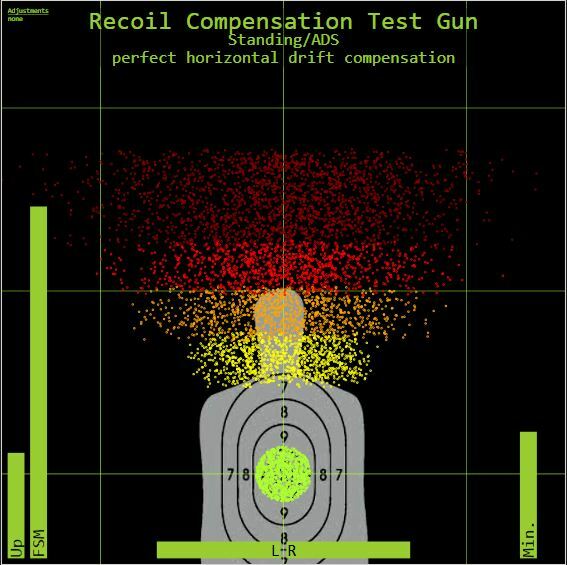 What affects my recoil compensation in a bad way? ItÂ´s almost impossible to compensate in the right direction with the right speed while in battle. I even doubt you could achieve this while firing against a wall on a private server. Your first shot will recoil more then the following shots. Keep that in mind. So you will pretty much never be able to compensate perfectly the first shot by moving your mouse down faster and then slow down for the rest of your burst. ItÂ´s hard to compensate for it and only few manage to do it. It requires some training. Remember what I said about horizontal recoil? The faster you fire, the more your gun will shake in the same amount of time. Every input is affected by your own reaction time. We canÂ´t compensate for the first shot on our fictional gun ( -> 2. ). So the second shot will be already off our initial aiming point. With our fictional fun we will fire 3 more shots before we can react ( 3 x 66 ms + 66 ms (first shot) = 264 ms). 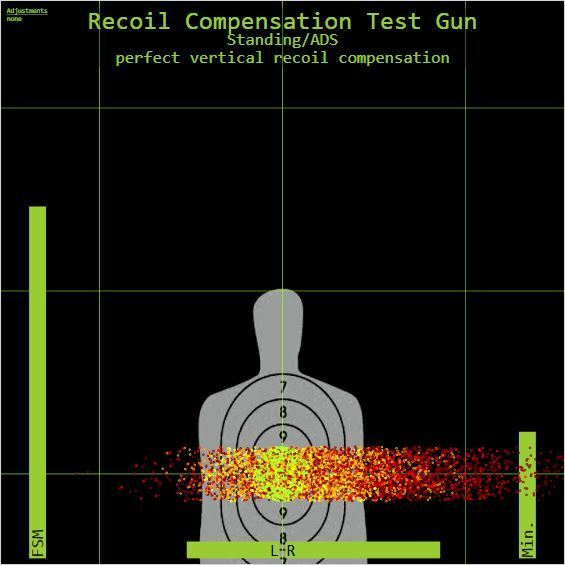 And itÂ´s unlikely that you compensation will be even close to perfect after those 264 ms.
For recoil values assuming perfect RC (no vertical recoil, symmetric horizontal recoil), you might want to check out this thread: Horizontal recoil assuming perfect recoil compensation. Credits for the numbers to timminator and Cheapnub. You CAN compensate for FSM perfectly fine, it's like normal angle of recoil but just magnified. It is not part of weapon's effectiveness, only ease of use. This is not entirely true. You should start moving the mouse just before you click the fire button. That way your reticule will already be moving down when the recoil starts. You just aim a bit higher than where you try to hit. Furthermore, each click of the mouse adds downwards pressure to the mouse, allowing for a natural way to compensate for the first shot's higher recoil. I have to disagree about not being able to compensate for the FSM. After playing with the M16A4 and M4 regularly I've found that you can, even on console, do a pretty good job of compensating for that first shot. There is a markedly steeper learning curve to it but with practice you get pretty good at it allowing you to place a lot of rounds into a very small area fairly quickly. In theory yes. In praxis you donÂ´t have time to think about the order of your actions. 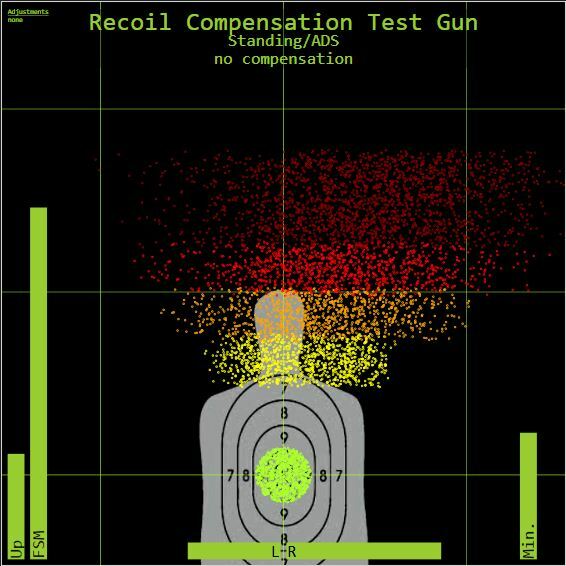 Your recoil compensation is much more influenced by reactions to things that happen in the game (such as starting to fire) then by active thinking about what you are doing with your mouse/control stick in this moment. Or do you think while playing "hey, I should start pulling down right now" ?? Your second point highly depends on the way you hold your mouse. A claw grip could act this way. A wrist grip is unlikely to give you this effect. Ok to solve it for you: If you look at sunÂ´s gameplay with the AN-94 you will notice that he is barely affected by the recoil of the gun after the first burst. He starts compensating to the average recoil speed while bursting. In combat you tap the trigger a lot faster which lets even burst guns handle quite similar to automatic weapons. You still achieve some kind of average recoil speed which you are ultimately compensating. oh and I wanted to only work with the recoil, so the fictional gun was a good way to eliminate all other factors aside from recoil. The hbar-FG thing is rezals job and he did perfect plots in his thread. I never said you can do it perfectly but FSM can be compensated for to one degree or another. Like qazserNOS said, you just start your downward pull fractionally before firing the burst then let up a little to keep the target in your sights. Its a practice thing, not a conscious decision. When I first picked up the M16A4/M4 I spent an hour or so in an empty server just shooting at a wall getting a feel for the recoil while getting visual feedback to my efforts. Do I get it right everytime? No, especially in more difficult circumstances. But as I use the weapons more and more the more often I get it right or close enough to down a target before they know what happened. And still you canÂ´t compensate the FSM to the same extend as the normal fire. And you obviously took it quite serious to train for it but still. And this "guide" is probably not for you then. You know what you are doing and for you it works fine. The average person wonÂ´t be able to compensate the FSM. I canÂ´t, 99% of the people whoÂ´s gameplays I watch canÂ´t and many others on this forum canÂ´t. Even rivalxfactor doesnÂ´t manage to compensate it on his wife the m16. Just watch some of his clips shooting a wall. You still see him missing to compensate.